I don’t even really need to tell you that this ice cream is delicious. 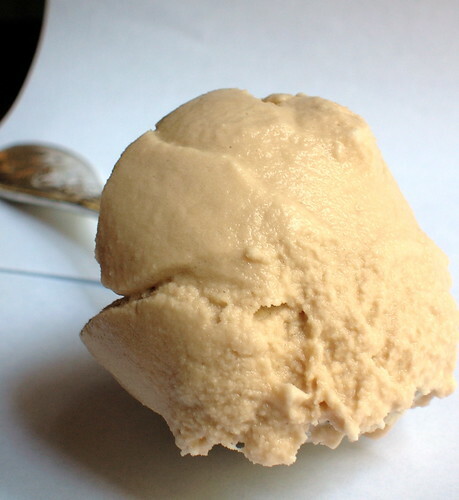 All you have to do is read the title: “brown sugar sour cream,” and know that the creamy tang of sour cream paired with the caramelly sweetness of brown sugar adds up to wonderful ice cream. One thing I’ve learned about making ice cream is to consider using a range of dairy products: sour cream, mascarpone, ricotta, goats milk, cream cheese, yogurt, all make good ice creams. Just writing this, I'm already brainstorming an idea for ice cream using Devonshire cream. When I thought of this particular brown sugar-sour cream combination, I knew immediately I had to try it, and since all you have to do is combine everything in a blender, it was very easy. A little splash of bourbon brought everything together perfectly, and kept the ice cream soft in the freezer. My only qualm is that the texture is bit more of a sherbert than an ice cream, which is fine with me, really. I think this is very adaptable to different flavor additions: a little cinnamon, or a bit of lemon zest, even a rum-raisin incarnation. And I also shouldn’t have to tell you that this pairs beautifully with peaches. 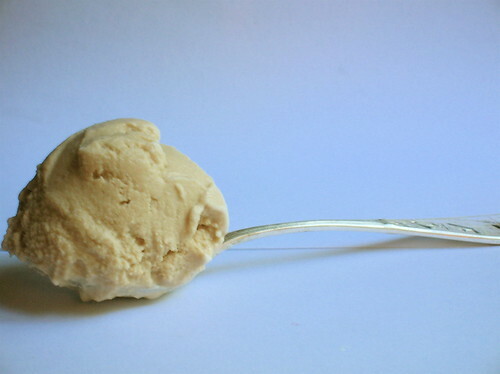 A great ice cream with the caramelly sweetness of brown sugar and the tang of sour cream, this is also a cinch to make. I imagine you could play around with the dairy, using mascarpone or strained yogurt in place of the sour cream, though I haven't tried it. 1. Place all ingredients in a blender and blend until completely smooth. Place in the refrigerator and chill thoroughly. Pour into your ice cream maker and churn according to the manufacturer's directions. Store in the freezer. I made a sour cream blueberry ice cream recently that just wasn't as good as I expected it to be and I can't figure why, because I've made it before and loved it. I love your suggestion of adding rum raisins to this ice cream, it would be perfect. That's IT!! I'm getting an icecream maker....I can't stand any more!! I don't even care that I live in England and we're currently experiencing the coldest August since hell froze over - I want to try these flavours - even the beet. It all looks GORGEOUS!! I will hold you entirely responsible for my new wardrobe when I balloon up a size....Where shall I send the bills?!! Anja- yes, you can make it, follow David's instructions for making ice cream without a machine. Brilynn- I wonder what happened to your ice cream this time? I did find this ice cream had a much more sherbetty, less creamy, texture than other ice creams. However, it does help to run it in the blender until it's as smooth as possible. Michelle- I'm so flattered, thanks! Lesley- you made me laugh. Do try the beet ice cream, it's my favorite. Just remember to enjoy the ice creams in small portions! This delight is truly that easy to make?! I must try this...it sounds just decadent! Yea - another great one under your belt. That about does it. I'm declaring every August ice cream month and I'm making your recipes :) I like the addition of bourbon here too. Mercedes, the sour dairy against the rich, pungent sweetness here is just divine. I made this tonight and it's great! It tastes a lot like rum raisin without the raisins. I think if I made it again, I would use less bourbon, as the bourbon is very much the dominant taste and I'd like to taste the sour cream more. Yummy though! Hey, I guess I'm commenting a bit late, but I just wanted to tell you that my husband and I have made this ice cream more times than I can remember now. We love, love, love it! Thanks for a brilliant recipe. Recently we've been substituting panela for the brown sugar, as I'm out of dark brown sugar. I recommend it highly. The panela adds an interesting smokiness (and it goes great with the bourbon). Just made this last night and it was divine. I always love no-cook ice cream recipes for convenience's sake and this one is a keeper. Such a silky, creamy texture--like firm soft-serve! thanks for all the efforts and recipes in ice cream making! I just got an ice cream maker and I found you blog just in time! So excited to try more of your recipes. The sour cream and brown sugar is awesome. This ice cream is amazing! We substituted good 7 year dark rum for bourbon and added about 1 tsp of ground cardamom....incredible!